On the upper left hand corner of most websites is the company logo. It has design elements which communicate trust or distrust. The landing page also has design elements which communicate trust or distrust. The impression of trust will cause a visitor to move on within the site. The impression of distrust will cause the visitor to leave. For example, the Crystal Clear Window Cleaning logo symbolizes “window cleaning” (expertise) in with a contemporary design (trust) to say that the company uses the latest window cleaning techniques. It is also bold and simple which dynamically makes the credibility point. Housen Painting symbolizes “house painting” (expertise) also in a contemporary design (trust) as the company uses the latest paints and is very efficient. 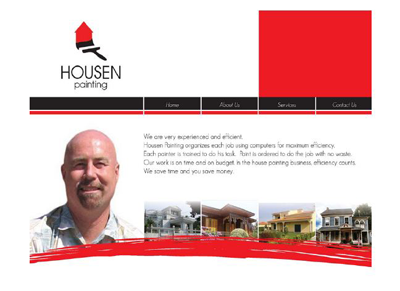 The Housen Painting website continues communicating credibility on the landing page with the credibility-based logo and website design working together. Accordingly, our research found significant increases in conversion rates with test respondents as they trusted the website enough at first glance to interact. For example, I am the credible source for this article. The message is the words I am using. The Website Magazine is the channel of communication. You are the reader or receiver. As a website, the company is the credible source. The message is the text. The computer is the channel of communication. The visitor to the site is the receiver. In all cases, the more credible the source (company) the more likely persuasion will occur. Both the Housen Painting and Crystal clear logos are examples of using credibility, expertise and trust, in the design. Most logos do not do this. The Housen Painting website extends the company credibility traits to the design of the landing page and subsequent secondary pages. Our research paper shows that this extra credibility applied with consistency in trait communication (total credibility) produces higher trust and interaction leading to higher conversion rates every time. Why is this a breakthrough in website design? Most websites do not use a credible logo or a credible landing page in their website graphics. The result is like Google AdWords says: Most visitors leave a website within the first 8-10 seconds. This problem is now solved. Websites today are like automobiles in the early 1900s. New advances occur each year. Applying source credibility theory to the company logo and website design working together is a major breakthrough. Download A Picture is Worth a Thousand Words: Source Credibility Theory Applied to Logo and Website Design for Heightened Credibility and Consumer Trust for free. Bill Haig, Ph.D. has worked in graphic design for many years as a non-designer working with clients. He was an apprentice for design legend Saul Bass (logos for AT&T, United Way, Alcoa, United Airlines, Girl Scouts among others). Dr. Haig is the pioneer in the new field of source credibility principles in communication persuasion applied to the creative elements of branding and integrated brand credibility strategy including website design. Haig teaches logo design and branding online at HOW Design University. He majored in psychology and communication at UCLA. His website is www.powerlogos.com where his contact can be found.